❒ Gases exert pressure on any surface with which they come in contact, because gas molecules are constantly in motion. We humans have adapted so well physiologically to the pressure of the air around us that we are usually unaware of it, perhaps as fish are not conscious of the water’s pressure on them. 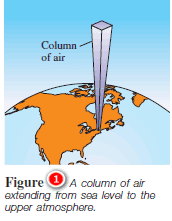 ❒ It is easy to demonstrate atmospheric pressure. One everyday example is the ability to drink a liquid through a straw. Sucking air out of the straw reduces the pressure inside the straw. The greater atmospheric pressure on the liquid pushes it up into the straw to replace the air that has been sucked out. ❒ Pressure is one of the most readily measurable properties of a gas. In order to understand how we measure the pressure of a gas, it is helpful to know how the units of measurement are derived. We begin with velocity and acceleration. ❒ The SI unit for velocity is m/s, although we also use cm/s. Acceleration is measured in m/s2 (or cm/s2 ). ❒ In fact, the density of air decreases very rapidly with increasing distance from Earth. Measurements show that about 50 percent of the atmosphere lies within 6.4 km of Earth’s surface, 90 percent within 16 km, and 99 percent within 32 km. Not surprisingly, the denser the air is, the greater the pressure it exerts. ❒ The force experienced by any area exposed to Earth’s atmosphere is equal to the weight of the column of air above it. Atmospheric pressure is the pressure exerted by Earth’s atmosphere ( Figure 1). The actual value of atmospheric pressure depends on location, temperature, and weather conditions. Does atmospheric pressure act only downward, as you might infer from its definition? ❒ Imagine what would happen, then, if you were to hold a piece of paper tight (with both hands) above your head. You might expect the paper to bend due to the pressure of air acting on it, but this does not happen. The reason is that air, like water, is a fluid. The pressure exerted on an object in a fluid comes from all directions—downward and upward, as well as from the left and from the right. ❒ At the molecular level, air pressure results from collisions between the air molecules and any surface with which they come in contact. ❒ The magnitude of pressure depends on how often and how strongly the molecules impact the surface. It turns out that there are just as many molecules hitting the paper from the top as there are from underneath, so the paper stays flat. How is Atmospheric pressure measured? ❒The barometer is probably the most familiar instrument for measuring atmospheric pressure. ❒ A simple barometer consists of a long glass tube, closed at one end and filled with mercury. If the tube is carefully inverted in a dish of mercury so that no air enters the tube, some mercury will flow out of the tube into the dish, creating a vacuum at the top ( Figure 2 ). The weight of the mercury remaining in the tube is supported by atmospheric pressure acting on the surface of the mercury in the dish. ❒ Standard atmospheric pressure (1 atm) is equal to the pressure that supports a column of mercury exactly 760 mm (or 76 cm) high at 0°C at sea level. Why 1 atm = 101,325 Pa ? ❒ A manometer is a device used to measure the pressure of gases other than the atmosphere. ❒ The principle of operation of a manometer is similar to that of a barometer. ❒ There are two types of manometers, shown in Figure (3) . The closed-tube manometer is normally used to measure pressures below atmospheric pressure [ Figure 3 (a)], whereas the open-tube manometer is better suited for measuring pressures equal to or greater than atmospheric pressure [ Figure 3 (b)]. ❒ Nearly all barometers and many manometers use mercury as the working fluid, despite the fact that it is a toxic substance with a harmful vapor. The reason is that mercury has a very high density (13.6 g/mL) compared with most other liquids. Because the height of the liquid in a column is inversely proportional to the liquid’s density, this property enables the construction of manageably small barometers and manometers. 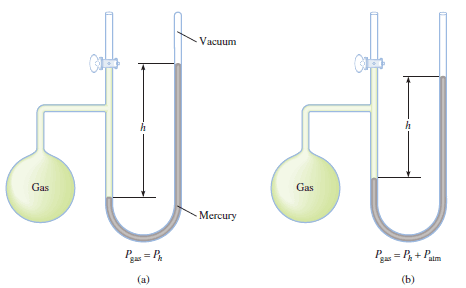 ❒ The figure (3) shows Two types of manometers used to measure gas pressures. (a) Gas pressure is less than atmospheric pressure. (b) Gas pressure is greater than atmospheric pressure. 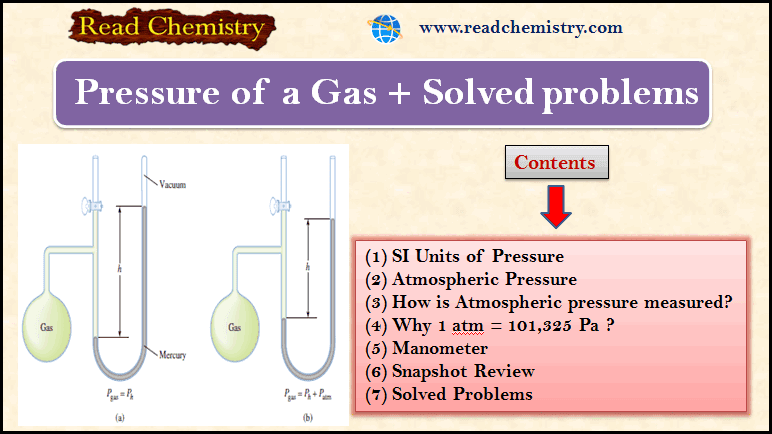 ❒ Pressure is defined as force per unit area. ❒ Fluids (gases and liquids) exert a pressure at any point within them in all directions. ❒ We can measure a gas pressure by the vertical height of mercury it can hold up. Example (1): The pressure outside a jet plane flying at high altitude falls considerably below standard atmospheric pressure. Therefore, the air inside the cabin must be pressurized to protect the passengers. What is the pressure in atmospheres in the cabin if the barometer reading is 688 mmHg? Example (2): The atmospheric pressure in San Francisco on a certain day was 732 mmHg. What was the pressure in kPa?